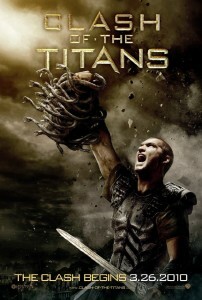 Review of Clash of the Titans in the style of the film. Story OK but a bit like it was cobbled together for twitter. Looked good. Nice costumes and props. Mix of solid and good special effects. Sound seemed a bit lacklustre. Might have been the system in the cinema. Gods were great. So was Olympus. Would love to have seen more of it. Were the hunters written to be played by Omid Djalili and Dwayne “The Rock” Johnson but they couldn’t get them: now that would be a double act I’d pay to see. Nothing to say about Sam Worthington. Felt like he needed to have screen time with someone to raise his game. Needed to be a bit of a bigger hero even if he was being man rather than god. Ok so I did have something to say. Lol. Could they cram a couple more cameos in? The religious nutter could have been played by Russell Brand. Andy Serkis as the Kraken? Soundtrack felt it had fallen off the back of a lorry (the one gladiators’ soundtrack was on just with the wailing woman turned down to 4 from 11). Who was who? Most only got a name check when they died. Not very epic. Needed more flesh. Maybe longer than 106 minutes. More Greek legend for the SMS generation. Despite all that enjoyed it as popcorn.